Big family house perfect for family get togethers. Private tropical style living on exclusive Cooloola Hill, which is the hill up behind Noosa Junction. The designer has created a sun soaked house with four undercover decks which fully capture the perfect north facing orientation.The high ceiling and louvred windows fill the house with natural light. This house has got it all! Stay with us, where a fair price is just the beginning! Our modern 5 bedroom, 2 bathroom home is surrounded by tropical gardens, four outdoor verandas and tropical pool. This double level residence sleeps 9 comfortably. Linen is optional you can bring your own or arrange it through us which we recommend for ease. Linen by us includes towels, face towels, bath mats and tea towels. Comprising master bedroom with queen size bed and ensuite. Two double bed rooms and 2 single beds in another room, in the fifth room there is a single bed and a lounge that becomes a bed if you need. Open plan living and separate BBQ area. This residence is more suited to a family who want privacy and tranquility in a tropical oasis. * 1 room with single bed and a fold out lounge. We can arrange full laundry service for the house, $100 or you can bring your own towels and bedding if you wish to avoid this charge. We are flexible to your needs please contact us with all your questions, we would love to make your stay in Noosa a great one. Situated in one of Noosa's most sort after suburbs for proximity to both Hastings St, Noosaville and Sunshine Beach. A 15 minute walk to Noosa's world famous surf beach, restaurants, cafes, boutiques, Noosaville's eat street and the Noosa National Park. Don't be taken in thinking you will not want a car in Noosa and only enjoy the main beach area as our Hinterland and river areas are both 'must explore' attractions. e.g. Lunch in Mapleton or walking your dog along Sunshine Beach in the mornings. Being opposite to Webya estuary you can also walk to Webya bridge for fishing, or an easy stroll straight from the front path to the Noosa Farmers Market on Sunday morning. Our favourite thing to do on Sunday morning. Fish, swim or surf on the nearby sandy beaches. Off street parking is available. Minimum stay two nights. Monthly stays can be negotiated. Bathroom range with every stay - Sukin Botanicals. Pets by arrangement and we can also send you links for hiring goods for young babies. Babies cot in Ensuite to main bedroom. The Noosa Bioshpere - The former Noosa shire was declared a Biosphere Reserve by the United Nations Education Scientific Organisation (UNESCO) on Sept. 20th, 2007. There are 531 biosphere reserves in 105 countries around the world. They serve as part of a global network of "living laboratories" or blueprints for sustainable development. Come see for yourself what all the talk is about. I have an organic bed and breakfast in the Hinterland of Noosa named Alaya Verde. I can be contacted via email if you have any questions. This house has a family of lizards that bask in the sun around the pool and down near the clothes line. It is a lovely place to stay while enjoying all that Noosa has on offer. Next to the kitchen and seats six. The upstairs balcony has a table with seating for eight. Beautiful house and helpful owners! We had a wonderful time in Noosa and a lot of that is owed to this beautiful house. The ten of us fit comfortably and it was a wonderful place to come back to when we were tired or the weather was bad. It only took us about 20 minutes to walk to Hastings Street and the walk was relatively well lit at night. The pool was great, perfect for when we weren't in the mood for the beach. Gina and Duncan were such helpful owners, they got back to us quickly when we had questions and helped us out when we needed extra linen! I highly recommend staying here with friends or family. The house was very pleasant although a little tired. There was no coffee despite a good coffee machine. There was no Airconditioning so if the weather was very hot, it would be unpleasant despite the good use of louvres. The noise of the freeway spoils the tranquility of the garden. We were a group of 8 ladies who stayed in the house, to celebrate my mum's 70th birthday. We thoroughly enjoyed our stay. The house was well equipped for our stay. Fantastic time spent at this property. The property has everything you need for a great relaxing break. Thank you for reviewing our home. House and location were good. No free access to lawn for dogs. Had to go through gates to get to lawn which isn't ideal. No A/C either. 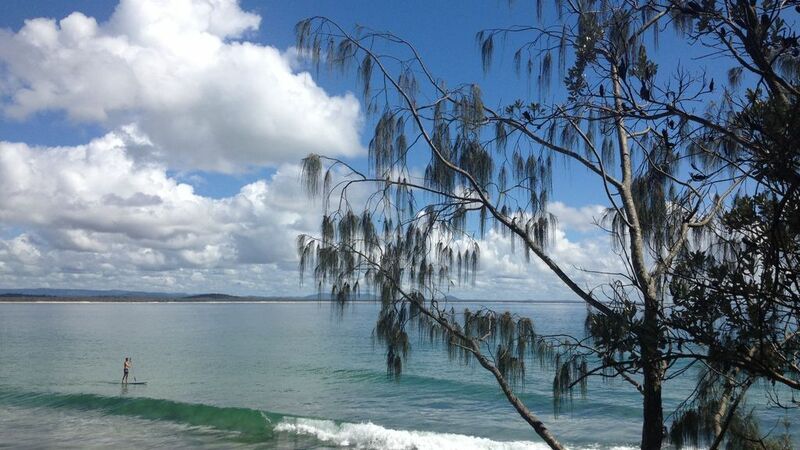 Noosa is one of the loveliest east coast of Australia coastal towns to visit.